First, meet MikMik (tmp name), the newest addition to our family. 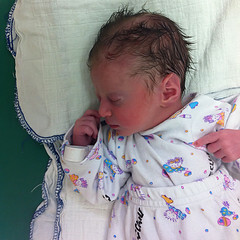 She joined us tonight at 2:38 AM at a staggering weight of 2 kilos and 250 grams. She’s a beauty, isn’t she? She’s a fighter. We know that after this past week. And to make a long story short, we knew that she would be born today. Knowing when you are going to give birth is an amazing thing. I think that is a good reason that god/our biology do not let us in on that date in advance. It is just too much stress. But, knowing when you are going to go in labor (it’s interesting that they chose that word right?) gives you time to prepare. So, just like any other loving male, I did my best to help prepare for the event (which may have been noticeable on the blog this past week). I helped pack a bag, prepare clothing, fix the room and so on. I also had lots of time to think about the photography gear I am going to bring into that room. Hit the jump to see my list. I decided to bring nothing but my smart phone. Now, this is definitely a personal choice, but I wanted to share the reasons for making this choice as lately I find myself reaching the same conclusion on less critical events. I think at the end it may come to this question: what role are you planning to take at this particular event? What Will You Be Worried About? Will you be worried about hugging your wife or figuring out the right ISO/WB/Shutter speed combo to take a picture in the challenging environment of an poorly lit room. Can You Live With A Critical Picture Which Is Not Technically Perfect? In a year from now, or maybe a decade, you’ll look back at the images you took with your smart phone. As much as we’ve progressed, iPhone images are not as good as DSLRs (+ strobes if you’re like me). They are grainier, softer, and noisier. Will you forgive yourself for having not-perfect pictures of this critical moment? Do technically perfect photographs matter? Where Will Your Heart Be 5 Minutes After? Will you be asking your wife to move just a bit to the left? To the right, turn just a notch? Is this what you wanna be doing now or would you rather be holding her hand or if possible the baby? Will you be packing/unpacking lenses, strobes? Looking for that camera which you put god knows where? It’s funny, the questions above quickly took over questions like how many strobes I should bring, or should I pack a prime or a zoom or both. The more I thought about it I figured out that I do not want to be a director in that scene and would rather be an improvising actor. I mean, when you look at the world via a view finder / LCD screen it looks different. The focus is different – it is 5 centimeters from your nose and not where the happening is. Even the mere physical act of putting an element between yourself and the environment, symbolic as it may be, felt wrong to me. So I decided to opt for the semi-shabby yet no so crappy iPhone cam. I snapped a few pictures after once we were in the safe zone, one of which opens this post. I think the question of whether to bring a big camera to events in your life is a real hard one. The tension between the need to document and the need to be there cannot always be balanced. I would love to hear your take in the comments.